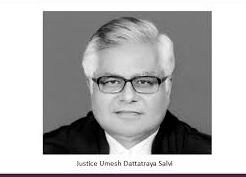 Justice Umesh Dattatraya Salvi took charge as the acting Chairperson of the National Green Tribunal (NGT) today, following the retirement of Justice Swatanter Kumar. Justice Salvi will continue in office until the date a new chairperson is appointed or the date of his superannuation, whichever is earlier, according to a government notification. He will retire on February 13, 2018. The NGT was established on October 18, 2010, under the National Green Tribunal Act for effective and expeditious disposal of cases relating to environmental protection and conservation of forests and other natural resources. The tribunal principal bench is located in New Delhi while its zonal benches are in Bhopal, Pune, Kolkata, and Chennai and its circuit benches are in Shimla, Shillong, Jodhpur, and Kochi. The tribunal consists of a full-time chairperson, judicial members, and expert members. The minimum number of judicial and expert members prescribed is 10 in each category and the maximum number is 20 in each category.